At the Baikonur Cosmodrome in Kazakhstan, Expedition 32 Flight Engineer Aki Hoshide (left) of the Japan Aerospace Exploration Agency, Soyuz Commander Yuri Malenchenko (center) and NASA Flight Engineer Sunita Williams walk by the upper stage of their Soyuz booster rocket in the Integration Facility July 3, 2012 as they completed a suited "fit check". 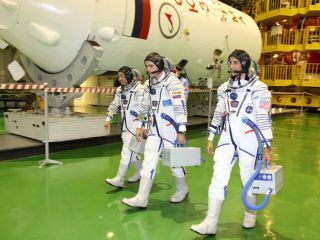 Three veteran space travelers from three different countries are gearing up to launch toward the International Space Station tonight (July 14) to begin a months-long mission to the orbiting laboratory. NASA astronaut Sunita Williams, Russian cosmonaut Yuri Malenchenko, and Japan Aerospace Exploration Agency spaceflyer Akihiko Hoshide will lift off on the Russian Soyuz TMA-05M spacecraft at 10:40 p.m. EDT (0240 July 15 GMT) from the Baikonur Cosmodrome in Kazakhstan. The three-person team will become part of the space station's Expedition 32 mission, and is due to stay for about four months. "We're really excited to be getting closer and closer to our launch in July," Williams said during a press conference in March. "It's going to be a great mission, really exciting, lots of things to do. We're sort of like a family and we've got a couple other great crew members up onboard." Williams and her crewmates will join the three spaceflyers already living on the space station: commander Gennady Padalka of Russia, his cosmonaut colleague Sergei Revin, and NASA astronaut Joe Acaba, who have all been in space since May. The Soyuz TMA-05M spacecraft is raised into position at the launch pad at the Baikonur Cosmodrome in Kazakhstan, Thursday, July 12, 2012. Today, the $100 billion space station is the product of five space agencies and 15 different countries working together to build the orbiting lab piece-by-piece since the first component launched in 1998. Like the Apollo-Soyuz Test Project, the Soyuz TMA-05 mission will take two days to arrive at its destination, with docking at the station planned for early July 17. The Expedition 32 crew will divide its time between space station maintenance and a hefty allocation of science research. "What I'm expecting is a lot of work," Malenchenko told SPACE.com. "Every day it's hours and hours, and it's my responsibility to do everything very well right on time and don't make mistakes, because before I start the work many people work for years on each of these experiments." Yuri Malenchenko: Malenchenko, 50, is a colonel in the Russian Air Force and will command the Soyuz spacecraft for Russia's Federal Space Agency. He is making his third trip to the orbiting lab as a member of an Expedition crew. A native of Ukraine, he flew his first long-duration spaceflight aboard Russia's Mir space station. Malenchenko then flew on NASA's STS-106 shuttle mission to the International Space Station early in its assembly period. He later commanded the station's Expedition 7 mission in 2003 and served as a flight engineer with the Expedition 16 crew in 2007-2008. The Expedition 32 mission is Malenchenko's fifth spaceflight. At the Baikonur Cosmodrome in Kazakhstan, Expedition 32 Flight Engineer Sunita Williams participates in a leak check of her Russian launch and entry suit July 3, 2012 as part of the suited "fit check" of the Soyuz TMA-05M spacecraft. Sunita Williams: Williams, 46, hails from Needham, Mass., and is a U.S. Navy captain making her second long-duration spaceflight. She served as a flight engineer on an overlapping mission that spanned the Expedition 14 and 15 missions in 2006 and 2007, and traveling to and from the station on NASA space shuttles. Akhiko Hoshide: Hoshide, 44, is an astronaut with the Japan Aerospace Exploration Agency and is making his second spaceflight on the Expedition 32 mission. An aerospace engineer by training, Hoshide first flew to the space station in 2008 during NASA's 13-day STS-124 shuttle mission to deliver Japan's huge Kibo laboratory module to the International Space Station. The space station research to be performed by the Expedition 32 crew covers a variety of disciplines, from biology and human health to basic materials science and physics. Now that the football field-size laboratory is completely built, the astronauts working there can devote more time than ever to carrying out experiments. "Through the remainder of this year, 200 experiments will be performed," said Tara Ruttley, associate program scientist for the space station at NASA. "Each of these investigations will provide knowledge that advances human exploration of space, and improves daily life on Earth." In September, Padalka, Revin and Acaba will fly back home, and Williams will assume command of the space station. She will be the second female space station commander to date, following in the footsteps of NASA astronaut Peggy Whitson, who commanded the Expedition 16 in 2008. "It's hard to say that I think I'll have any great challenges because we've got such a great crew," Williams said. "We're very easy to talk to each other. I think the open lines of communication will make being a commander pretty easy."